This multi-peptide cream is packed with moisture rich superfoods and hyaluronic acid to promote elasticity in the skin. Sacha Inchi peptides, a Peruvian superfood, helps smooth the skin and increase firmness. Coconut peptides rejuvenate and moisturise skin and has anti-wrinkle properties. This cream provides an intense boost of hydration, perfect for those with normal to dry, or ageing skin. Evolve Beauty promote a positive ageing philosophy around their Age Smarter 360 concept. They take care of the skin naturally at every stage of life, working proactively with the body to support graceful ageing. Massage gently into cleansed face and neck. 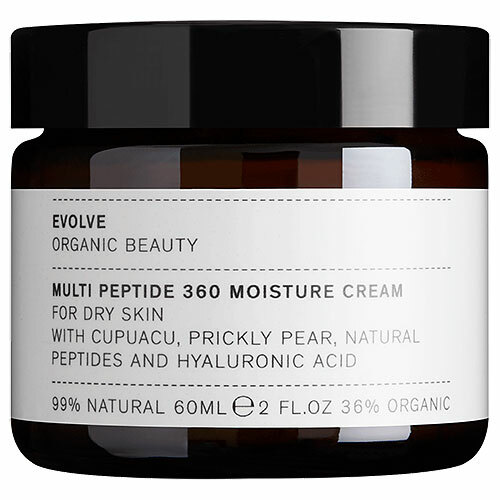 Below are reviews of Evolve Multi Peptide 360 Moisture Cream - 60ml by bodykind customers. If you have tried this product we'd love to hear what you think so please leave a review. This multi-peptide cream is packed with moisture rich superfoods, and hyaluronic acid, to promote elasticity in the skin. With Sacha Inchi peptides, a Peruvian superfood, to help smooth the skin, and increase firmness.